To kickoff this summer's 2007 season and Drum Corps International's 35th Anniversary, corps will play a new piece of music to cap off each night's competition. 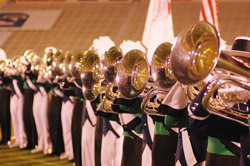 During the 2006 season, the sounds of "Champions Fanfare," composed by DCI Hall of Fame member Jay Kennedy, were heard through the horns of drum corps after each event. This year's new piece, "America the Beautiful" arranged by John Meehan of the Blue Devils, has been written distinctively for the 2007 Summer Music Games Tour. "We were looking for a fresh musical presentation to commemorate our 35th anniversary season, and we feel that this piece fits perfectly," said Drum Corps International Executive Director Dan Acheson. "'America the Beautiful' is not only beautiful and dynamic, but also serves to remind us to be thankful for the freedoms we enjoy." As an arranger, composer and instructor, Meehan has worked with many music ensembles from around the world including the Yokohama Scouts from Japan, Beatrix from the Netherlands, and various notable high school marching band programs from all over the nation. A member of the Blue Devils' staff since 1994, he has helped the corps to five Drum Corps International World Championships and eight Jim Ott High Brass Awards. "I knew when I composed the 'America the Beautiful' arrangement that I wanted to write something the audience would be excited to listen to in addition to writing something that corps members would enjoy playing," said Meehan. Among the traditional strains of "America the Beautiful," fans may notice a few familiar notes of "Auld Lang Syne" at the intro of Meehan's arrangement. Meehan said he included the well-known musical quote as a tribute to former and future generations of drum corps members. Kicking off the special festivities of this Saturday's show in Annapolis, Md., Meehan's "America the Beautiful" arrangement will be played by all six competing units after the announcement of scores. Fans will be able to hear the piece played by two select corps to conclude each Drum Corps International sanctioned event this summer. "It was an honor for me to be asked to write this piece," said Meehan. "I've been involved with the drum corps activity practically since I was born, and to be asked to write something that all Drum Corps International corps will perform this season is very exciting for me."